A stroll in the vines, relaxing picnic, candlelit dinner or helicopter flight - there are so many winery experiences, across our amazing wine regions, to share with your plus one (or spoil yourself with) and who says we need to be restricted to 14th February? Here is a small selection of winery experiences that are all about the romance, any day of the year. Nothing says je t'aime like a glass of sparkling. On The Art of Sparkling Experience at Josef Chromy, go the extra mile for the one you love by learning how to make it. On this experience you'll tour the Josef Chromy winery and learn how traditional method sparkling wine is made. The art of making sparkling is explained (and tasted along the way) from base wine to corking and wiring. 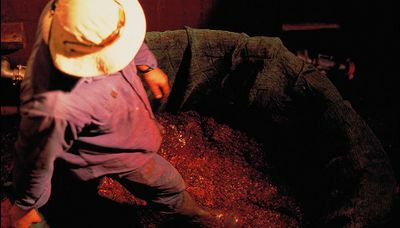 Witness disgorging the sparkling wine to remove the yeast, then work with the winemaking team to choose and add the liquour, the final step in sparkling winemaking. You'll produce a bottle of sparkling to your own taste to take home before enjoying lunch matched with wine and a complementary tasting. 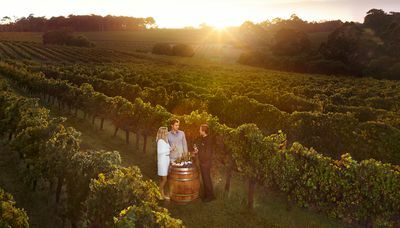 The best way to enjoy the Penfold's Magill Estate Twilight Tour and Luxury Degustation is with your favourite person. Your host will take you on a journey through Penfolds history including a visit to the Grange Cottage and the vintage cellar. You will also experience the underground drives and see the original hiding spot of Max Schubert’s Grange. Next you'll head to the award-winning Magill Estate Restaurant where you will indulge in a 7-course Degustation Experience. Each course is expertly matched with a wine carefully selected from the cellar by the Sommelier. No discussion of romantic experiences is complete without mention of a picnic. You'll be in the hands of experts on Audrey Wilkinson's Picnic Among the Vines, where you'll enjoy a self-guided tour of the onsite museum, masterclass and premium tasting from the in-house wine expert before selecting a private spot within the magnificent 270 acre property to tuck into your picnic hamper and choice of wine. Bask in the Hunter Valley sunshine, admiring picturesque views in total seclusion. The Ultimate Leeuwin Estate Experience is the most extraordinary way to be introduced to the Estate and the ideal way to spend a day with someone special in Margaret River. Your host will greet you upon arrival and welcome you to the Estate with a glass of Brut. You'll take a guided tour of the unique collection of contemporary artworks that feature on the labels of Leeuwin’s premium “Art Series” range of wines while enjoying a selection of canapés. 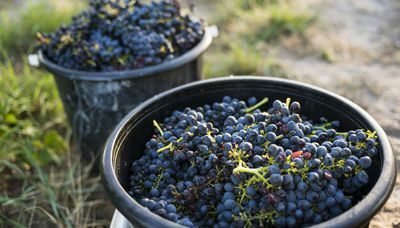 Next you will be invited to take part in a hands-on red wine blending session, the ‘Discovery of Winemaking’, during which you will have the opportunity to blend your own Margaret River red wine, a memento of your day. A seated tutored wine tasting of five Leeuwin Estate wines will follow, each accompanied by perfectly matched seasonal food. A special ‘Icons’ five course degustation menu will then await you in the award winning restaurant. Your Host will guide you through each of the perfectly matched courses paired with selected current and museum releases of the iconic Art Series Chardonnay and Cabernet Sauvignon. The St Hugo Legacy Experience is the ultimate declaration of your affection. Start with a private helicopter flight to the home of St Hugo in the Barossa Valley, from there take a subregional wine journey, inspired by Hugo Gramp’s legacy and his pursuit of excellence as you taste the finest old vintages and special blends before a private tour of the estate. You will enjoy an 8-course lunch created to perfectly match St Hugo wines and finally, to complete the experience, you'll receive a special St Hugo gift package to toast to your shared future happiness. We highly recommend whisking your significant other off for an overnight stay in Victoria's sturnning King Valley. The Pizzini Overnight Wine and Food Escape combines a structured tasting at the cellar door with local cheeses, a picnic basket to share in the cellar door garden, overnight accommodation at the Pizzini owned Mountain View Hotel and a four course dinner with matched wine made by Joel Pizzini, in the fine Dining Lounge.